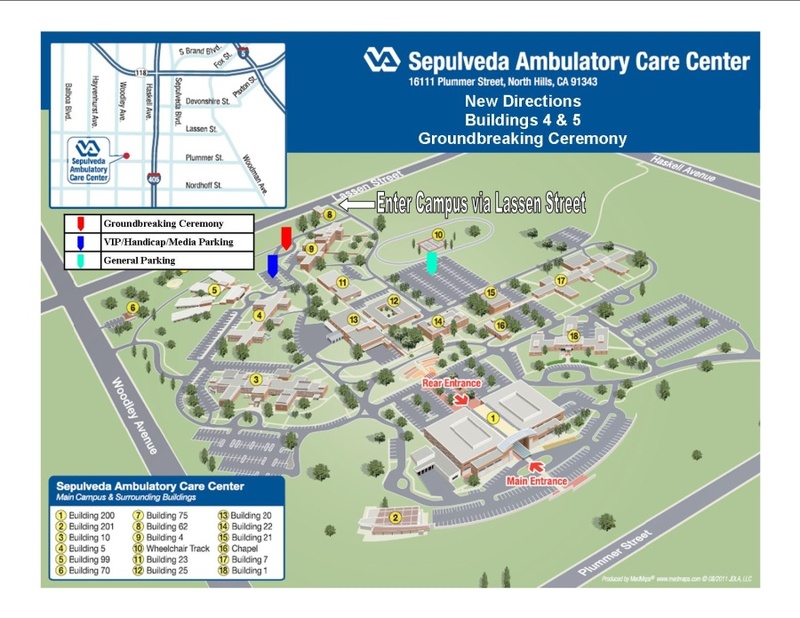 LOS ANGELES, CA., Jan., 25 – VA Greater Los Angeles Healthcare System (GLA) in collaboration with New Directions Inc. (NDI) and A Community of Friends (ACOF) will host a groundbreaking ceremony for the Sepulveda Ambulatory Care Center (SACC) buildings 4 and 5, on Friday, February 3, 2012 starting at 11:00 am. Buildings 4 and 5 will provide supportive and therapeutic housing for 147 formerly homeless veterans and disabled veterans. We are thrilled to have such great partners (NDI and ACOF) working on this housing project. Buildings 4 and 5 will be renovated and veterans will be able to live in fully furnished units with full kitchens and a dining area. Having these buildings on VA grounds will provide veterans with optimum access to VA case managers, social workers, mental health staff, and other health care services. Moreover, this project is in line with VA Secretary Shinsekis goal of ending homelessness among veterans by 2015, said VA GLA Director Donna Beiter. The buildings will be for veterans only, and approximately 7.05 acres of the SACC property will be involved. Because of our location on the VA campus, veterans living in these two buildings will have easy access to the VAs excellent medical care, said NDI President and Chief Executive Officer Gregory Scott. The project will begin construction in early calendar year 2012 and it will be completed in approximately 2 years. “ACOF is excited to be part of such an important and critically needed project. We have seen the need to provide long term housing opportunities for veterans as a result of our work. We are thrilled that our partnership with the VA and New Directions has finally come to fruition,” said ACOF Chief Executive Officer Dora Leong Gallo. “NDI/ACOF will create a safe and secure project. There will be a live-in property manager in each building and a front desk concierge 24 hours a day, seven days a week.” said VA GLA Director Donna Beiter. NDI and ACOF have set hiring goals that 10 percent of all construction contracts and subcontracts are with veteran owned businesses and 10 percent of all construction workers are veterans. Moreover, NDI and ACOF will incorporate job training for veterans and formerly homeless veterans during construction. If you would like to attend the groundbreaking ceremony or have questions about the project, please call Wileen Hernandez at 310-268-3858. Please see the document attached, it contains a very helpful map indicating the location of the groundbreaking ceremony and parking information. VA GLA is the largest, most complex health care system within the Department of Veterans Affairs. GLA consists of three ambulatory care centers, a tertiary care facility, and 10 community based outpatient clinics. GLA serves veterans residing throughout five counties: Los Angeles, Ventura, Kern, Santa Barbara, and San Luis Obispo. There are 1.4 million veterans in the GLA service area. Visit us on the web at www.losangeles.va.gov for additional information. ACOF is a regional nonprofit affordable housing developer whose mission is to end homelessness through the provision of quality permanent supportive housing for people with mental illness. Since 1988, ACOF has completed over 1,400 units in 37 buildings in Los Angeles and Orange counties. ACOF’s goal is to create a stable housing environment where persons with special needs can build independent lives. Visit ACOF at www.acof.org for additional information. Founded in 1992, New Directions, Inc. is a 501(c) 3 public benefit corporation that provides comprehensive services to hundreds of homeless veterans each year in five transitional housing facilities. These services include treatment for substance use and mental health disorders, case management, clinical assistance, legal assistance, remedial education, money management, computer training, employment assistance and placement in permanent housing. Today it is estimated that 8,000 veterans live on the streets of Los Angeles. Visit NDI at www.NDVets.org for additional information.